Today, we're looking at the 1950 Academy Award for Best Actress. 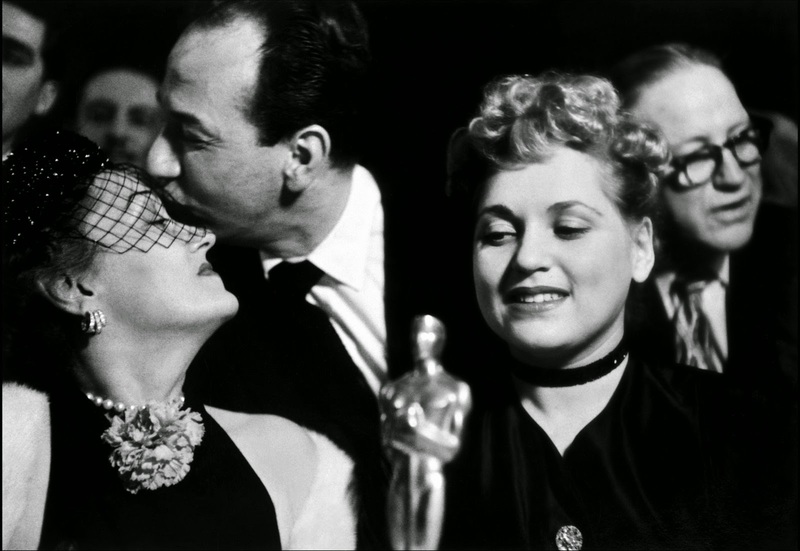 Above, winner Judy Holliday looks at her trophy while being congratulated by fellow nominee Gloria Swanson. Judy Holliday was a surprise Best Actress winner for her turn in Born Yesterday as a supposedly naive mobster's girlfriend who turns out to be one smart cookie. Pre-show prognosticators had predicted the race would be between Bette Davis and Gloria Swanson, two legendary actresses who were nominated for their comeback roles. Holliday was also competing against Anne Baxter and Eleanor Parker, who were two well-established actresses with juicy roles. The clip below shows Holliday's Born Yesterday co-star Broderick Crawford announcing the winner. Holliday forever defined the "dumb" blonde role with her portrayal of a former chorus girl turned defender of Jeffersonian democracy in Born Yesterday. Holliday was an overnight sensation when she played the role on Broadway, and she is equally compelling in the film version. In fact, she's really the only reason to watch the film, which deflates like a punctured balloon when she disappears from the screen (which, to be fair, isn't very often). Holliday delivers a series of hilarious non sequiturs ("You're just not couth," she tells sugar-daddy Broderick Crawford) in an indelible Bronx-laden squeak that is instantly recognizable even for those who have never seen the film. Holliday is equally compelling in the film's quieter moments, especially when she's blossoms under the tutelage of a journalist played by William Holden. By the late 1940s, it seemed that Davis was all washed up in Hollywood. Davis had once been the queen of Warner Brothers, winning two Oscars and appearing in box-office smashes like Jezebel (1938), Dark Victory (1939) and Now, Voyager (1942). Her fortunes had reduced considerably in the late forties, and she was appearing in second-rate fare like Beyond the Forest (1949). 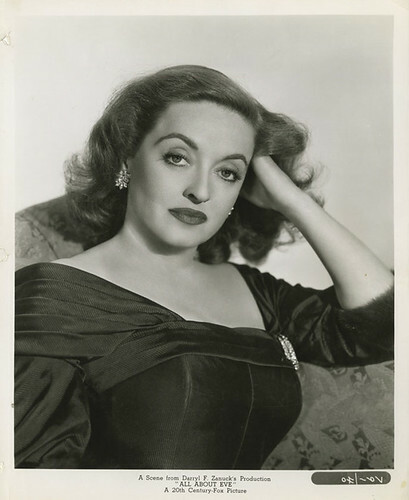 Everything turned around for Davis when she won the role of aging theater actress Margo Channing in All About Eve after Claudette Colbert, the first choice to play Margo, severely injured her back. Davis made the role of Margo all her own, earning a place in screen immortality by standing on a staircase and uttering the famous line, "Fasten your seatbelts, it's going to be a bumpy night." Swanson made an even bigger comeback in 1950 than Davis. Swanson was a leading actress in the silent era, making millions for Paramount Pictures in films like Queen Kelly (1929) and Male and Female (1919). Like many silent stars, Swanson lost her place when Hollywood began making sound pictures. 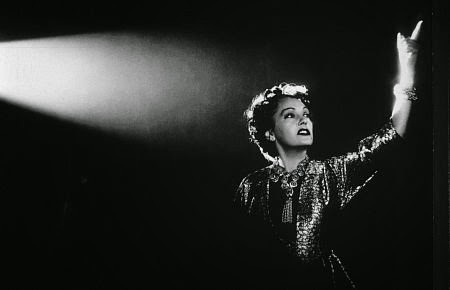 Swanson moved on with her life and she was happily hosting a talk show in New York when director Billy Wilder asked her to take the part of delusional silent film actress Norma Desmond in Sunset Boulevard. Swanson gives a searing performance that still has great impact today, but earned visceral reactions for fifties audiences who were used to more restrained fare. Mary Pickford was literally overcome by Swanson's performance at the film's premiere (she was led from the room sobbing) and Barbara Stanwyck got down on her knees and kissed the hems of Swanson's skirts. Swanson was a favorite on Oscar night (even the ultra-competitive Davis thought she should win), but Swanson had to content herself with being the star of the Oscar's New York party. Even after 40 years in show business, Swanson was still a hustler. She is literally front-and-center in almost every photo that was taken that night. Baxter is probably best known today for her camp-classic portrayal of Nefretiri in The Ten Commandments ("Moses, you stupid, splendid, adorable fool"), but she was one of Hollywood's leading dramatic actresses when she took on the role of the conniving Eve Harrington in All About Eve. 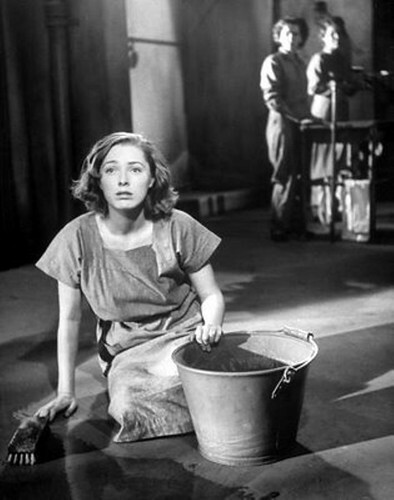 Baxter had already earned a supporting actress Oscar for her fine work in The Razor's Edge (1946), but Eve, a manipulative young woman who will do almost anything to fulfill her dream of becoming a Broadway star, is one of Baxter's best creations. Eve is an actress in every sense of the word: She's always on, always performing, finely calibrating each syllable to gain the sympathy of her audience and gain the advantage for herself. Eleanor Parker is considered the also-ran in the 1950 best actress race, but she gives an extremely compelling performance in Caged as a pregnant widow who is sent to prison for participating in a botched robbery. Caged is a Warners' social realism drama set in a women's prison. Parker played many types of characters in her long career, she was known as "the woman of a thousand faces," but she is unforgettable here as a young woman who moves from a naive innocent to a hardened inmate during her time in the big house.